New safety guidelines are needed to stem the rise in trampoline-related injuries, child health experts say. A study in the journal Injury Prevention found a "worrying trend" in the number of childhood fractures linked to trampoline use in the home. The team found one hospital, the Royal Berkshire in Reading, treated eight children for trampolining-related fractures in two summer months in 2003. They said metalwork should be padded and complex moves discouraged. The researchers looked back at the operative records of children up to the age of 18 for 2001 and 2003 over July and August - the months when most childhood fractures are seen. In 2001 just one child was treated for a trampoline-related fracture at the Royal Berkshire, but in 2003 trampoline-related breaks accounted for more than one in 10 childhood fractures. This reflects earlier research by the Royal Society for the Prevention of Accidents (RoSPA) which estimated the number of trampoline related fractures having looked at the records from 18 hospitals. RoSPA found that 11,500 people in the UK went to hospital after a trampoline-related accident in 2002 - an increase of more than 50% over a five-year period. 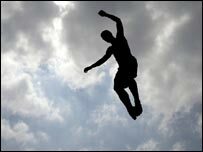 Accidents on trampolines at home had increased almost fourfold in the same time, with 4,200 under-15s being hurt in 2002. The team behind the latest research said: "We have identified a worrying trend in the incidence of paediatric fractures related to trampolining and our statistics are mirrored by both Rospa and international findings." They added that although few could deny the fun of the activity, public health clinicians should support the introduction of new safety guidelines. The research also reflected US research which found a 98% increase in people with trampoline-related injuries arriving at A&E departments. It corresponded to an estimated five-fold increase in trampoline sales during the same period. Trampolining at home appears to be gaining popularity, with 40,000 trampolines being sold in the UK in 2003. Roger Vincent, of RoSPA, said: "Trampolines can now be bought relatively cheaply from such places as garden centres and DIY stores. "Problems can arise because the trampoline may be too big to use safely in a garden when the buyer gets it home - it may have to be placed too close to fences, trees or hard surfaces such as patios in a small garden - or because people do not follow the basic safety rules. "Approximately 75% of injuries occur when more than one person is on the trampoline. "The person weighing less is five times more likely to be injured and children under six years old are particularly vulnerable to injury."